BuyHatke Offers to Pay Rs. 1 & Get Rs. 10 Paytm Cash is going on from past few Days. If you still not apply this Offer then you can do now without any delay. Plus now you can also refer your Friends to Earn Rs. 20 for Each Valid Install. I'll show you How. Get the Buyhatke Extension by Clicking On HERE. After installation, go to the options page of the extension from here. The link would only open when the extension is installed. 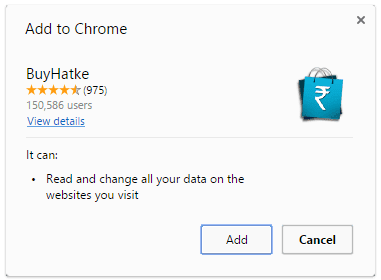 You can go to this link by right clicking the Buyhatke extension button on the Toolbar and selecting ‘Options’ from the menu as well. You would finally see a page like the one shown above. Click on "Claim Now" button and authorize Buyhatke via Facebook. You would be redirected to Paytm wallet page. Else, just login into your Paytm account and then press pay. You can just pay from your Paytm wallet as well. For referral, you have to login to BuyHatke by Linking your Facebook Account with BuyHatke. Or you can Create Manual Account too. You have to Enter your Email & Password for registration. Then go to your Email Account to confirm the Registration. Now your Referral Link will be showing. Just Copy that Link & Share with your Friends.